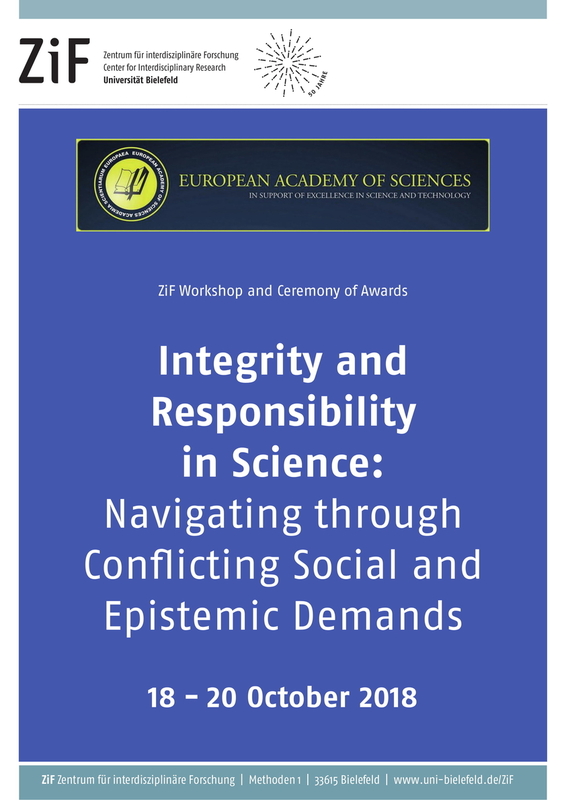 The European Academy of Sciences annual conference 2018 at the Center of Interdisciplinary Research (ZiF) at Bielefeld University took a reflecting stance on the sciences and focused on a specific topic, namely, the integrity and responsibility of science. This involved the emphasis on responsibility with regard to the process of gaining reliable knowledge and regarding the impact of science on society. The first topical wing concerned the epistemic integrity of research. This means responsibility for the epistemic standards and practices that are brought to bear on the research. One thing certainly is that no fraud occurs and data are not manipulated. As many scandals in the past years have made obvious, research integrity is much less a matter of course than one might anticipate. Think of the case of a social psychologist who fabricated data to support baffling claims. For instance, people who think of eating meat act more selfishly and inconsiderately. This turned out to be fake news. Social psychology in general has plunged into a huge credibility crisis a couple of years ago, since many pieces of textbook knowledge, well established in the field, turned out to be non-reproducible. It is still not quite clear where exactly to place the blame. The mistakes could be due to flawed experimental setup, methodological blunder or inappropriate statistical analysis. This problem of research ethics was discussed extensively at the conference. In particular, problems emerging in the collaboration of several authors were addressed. A general maxim is to be wary of what your co-authors do and not to trust blindly that everyone plays by the rules. In addition, two opposite schemes of authorship were debated. One such scheme adheres to the traditionally strong notion of authorship and demands that at least one person, but preferably all co-authors of a paper, assume responsibility for the integrity of the entire article. The alternative is to divide up responsibility and to assign authorship to specific parts of the joint work. The second branch was social responsibility. The idea is that science has become a powerful tool that can do a lot of damage. Science pursues practical ambitions and has a significant impact on the world outside of seminar rooms and laboratories. Society often gains a lot of practical benefit from scientific research, but risks emerge as well. The implementation of scientific findings into technology or other procedures may have unwanted consequences, such as failure or side-effects. One of the positions taken regarding the responsibility of science says that scientists are also citizens and in this role bear responsibility for what is done with what they have created. In particular, scientists are assumed to look further than ordinary people as to what consequences might ensue from their discoveries and inventions. This enhanced knowledge burdens scientists with a particular responsibility, a responsibility that is more demanding than the one all citizens share. However, this view is contentious. Some scientists and scholars believe that social responsibility for what is done in practice with scientific output lies exclusively with politics. It is the responsibility of science to produce reliable knowledge, politics needs to tell to which social use this knowledge is put. One of the controversial issues discussed concerned the amount of foresight knowledge that is required for assuming responsibility for the social consequences of science. It is difficult and sometimes impossible to anticipate the future course of science, let alone subsequent technological inventions. An alternative discussed was to keep judgments about the social impact of knowledge independent, as far as possible, from such uncertainty. In this vein, the maxim of revisability or the insistence on applying fair and transparent participatory procedures in introducing a technology gain in importance. Schemes of public participation in the research process and its technological implementation were debated. Another controversial issue has been whether the 'common good' science is expected to augment can be defined even vaguely. An alternative is to reflect different conceptions of the common good in a variety of competing research lines. Parts of science suffer from a credibility crisis these days. According to a lot of public surveys, ordinary people, science-literate people among them, do not think highly of the trustworthiness of applied fields in science such as agriculture, food, health and disease. The Higgs boson is not the problem, but dietary recommendations or vaccination rules are a problem for many. In these polls, people do not hide their motives. Many admit their fear that science is driven by economic and political forces. It is the influx of large amounts of money that pushes science into certain directions and makes scientists inclined to accept certain result without testing them too severely. That is, parts of the wider audience assume that research sometimes proceeds in a one-sided fashion with respect to the questions asked and the answers accepted. This does not apply equally to all branches of science, but it applies to fields of practical relevance where money tied to specific interests is feared to distort the process of knowledge gain. It has become part of a fashionable critical attitude to be skeptical about science. In part, science is the victim of large-scale social trends, but in part science is the culprit. These considerations bring out the ambivalent role of trust in science. On the one hand, science is in need of public trust in order to thrive and needs to struggle for regaining public trust. On the other hand, science is thought to embody a skeptical spirit. Viewed in this way, public mis-trust with respect to science should be appreciated. But large parts of science and the general public feel that critics, such as climate-change deniers or vaccination skeptics, have overshot their goal by combating truthful and important insights. Lack of trust has become harmful and begins to hurt society. Accordingly, the challenge is finding the right balance between trust and distrust, and, given the problematic fields mentioned, exploring ways for regaining public trust. It belonged to the chief assets of the conference that scientists of various fields debated such problems in a broad interdisciplinary exchange with philosophers and historians of science, and with ethicists. No easy solutions emerged, but the challenge to navigate science through conflicting epistemic and social demands became palpable to everyone involved.